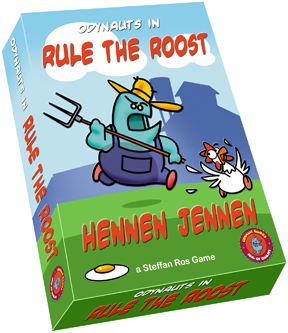 A funny, nerve-racking, and active card game for all ages in which you the rooster must collect and keep as many chickens around you as you can. But beware! Danger lies in wait. Foxes love a tasty chicken and the farmer likes moving you from one barn to another. Form a majority in one or more of the barns with your roosters to score points. But beware! Your opponents can chase you out of a barn with the farmer. Annoy your opponents by playing egg cards. Who is the first to lock a barn? And who will, just for one turn, be allowed to open it? Beautifully and cheerfully finished with illustrations by Uco Egmond, famous from the Eppo comics. An amusing and dynamic game that is also suitable for children without their parents. A wonderfully addictive distraction for adults: you won’t be able to play just for fun! Requires little investment to enjoy, the rules are easy and the turns short. On a seemingly innocent and charming little farm, the Odynauts are witness to a high stakes strategic game in which hens are the coveted prize. The roosters seek to draw as many of them in as possible with their charms. A sly fox is sneaking around the coop for a delicious meal, while the farmer is on a mission to catch him in order to protect his precious little hens. The Odynauts, of course, see a highly entertaining game in all of this. Are you the biggest, baddest rooster? Or are you just the smartest one?